Want to re-create the Muse sound or just looking for a great value guitar then the Cort Matthew Bellamy MBC1 Signature Guitar is worth a look. Matthew Bellamy, singer and guitarist for Muse is well known for his creative guitar driven songs. His unique style of playing the guitar gives Muse a unique recognizable sound. So if you want to re-create the Muse sound then you should take a look at the Cort Matthew Bellamy MBC1 signature guitar. Matthew Bellamy has worked with Manson Guitar Works, a well respected custom guitar builder based in the UK, for over 2 decades. In that time they have created some of Bellamy’s more unique guitars. Manson Guitar Works have personally over seen the design of the Cort Matthew Bellamy MBC1 Signature Guitar making sure that it fully replicates the original. What can you expect form the Cort Matthew Bellamy MBC1 Signature Guitar? The body is made from Basswood and has a single cut-away similar to a Telecaster or Les Paul. The bolt on neck is made from maple which is topped off with a 22 fret rosewood fingerboard. The body has a great looking matt black finish which really suits the design and feel of the guitar. The Cort Matthew Bellamy MBC1 Signature Guitar is fitted with a kill button which is surprisingly addictive! In terms of electrics the Cort Matthew Bellamy MBC1 Signature Guitar is fitted with Manson designed pickups. There is a single coil in the neck position and a Humbucker in the bridge position. There are master volume and tone dials and the pickups can be accessed through a 3 way pick-up selector. The Cort Matthew Bellamy MBC1 Signature Guitar also comes armed with a kill button which allows you to creatively expand the wide range of sounds available from the guitar. If you strum a chord and hit the kill button it cuts the sound. Hit the button on and off rapidly and you get a great sounding effect which is remarkably addictive. It is difficult to describe in words the sound effect so best to check out the demo video below. 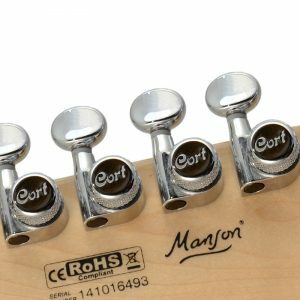 Cort designed locking tuners give the guitar rock steady tuning stability. The guitar is finished off with a Tune-o-matic bridge and stop tail piece and there are Cort locking tuners to ensure rock steady tuning stability. All in all this is an amazing guitar which plays fantastically well and at the £450 – £500 price point represents amazing value for money. If you are a fan of Matthew Bellamy and Muse or even if you are not and are just looking for a good quality guitar then the Cort Matthew Bellamy MBC1 Signature Guitar is well worth a look. To find out more about the guitar check out the Cort website. To buy this great guitar click on the link below.